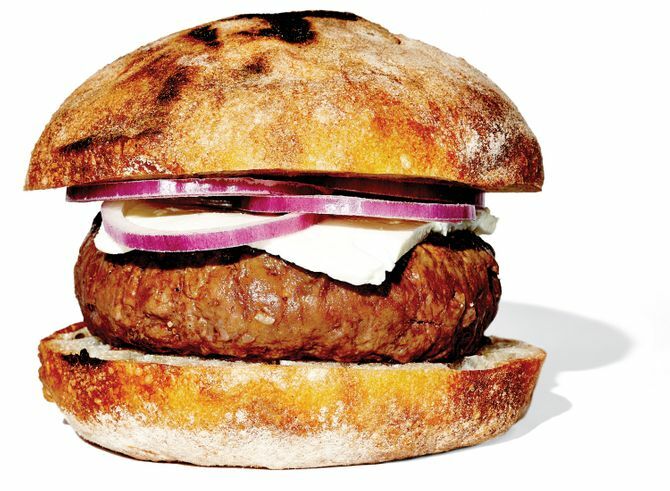 Rationed: Intentionally scarce burgers that have developed cult followings. 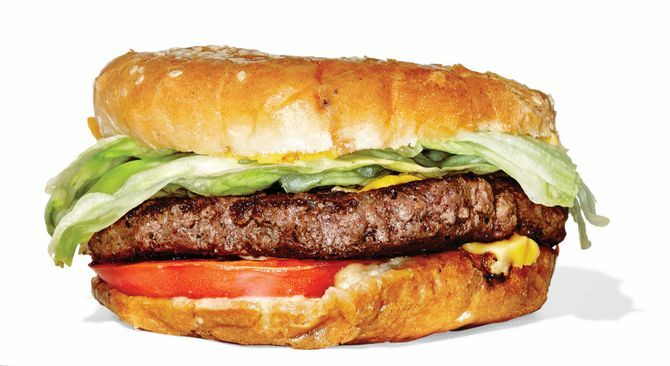 A daily tweet reveals each night’s number of burgers available at the bar — a figure that hovers between 11 and 15. 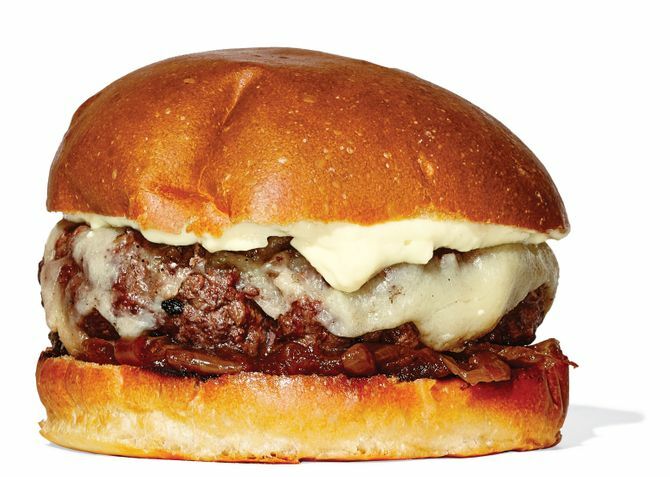 There’s dry-aged rib-eye in the blend, onions caramelized in bourbon, and beer cheese made from Fontina, Cheddar, and Brooklyn Lager. Nick Anderer’s Italian take (Gorgonzola, house-cured pancetta, escarole on rosemary brioche) is available only between 10:30 p.m. and midnight and only in the front barroom. Have a bowl of pasta for dessert. Competition is fierce for the dozen daily orders (and the nine bar stools where they’re consumed). 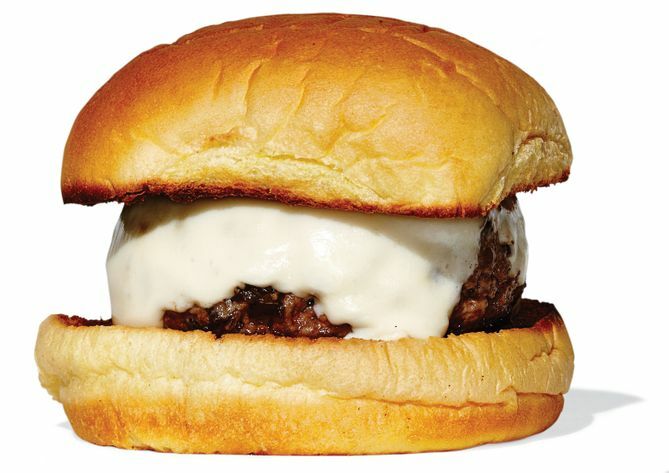 The patty’s pepper-crusted, the cheese is triple-crème Saint-Andre, and the sidecar of au poivre sauce puts it deliciously over the top. 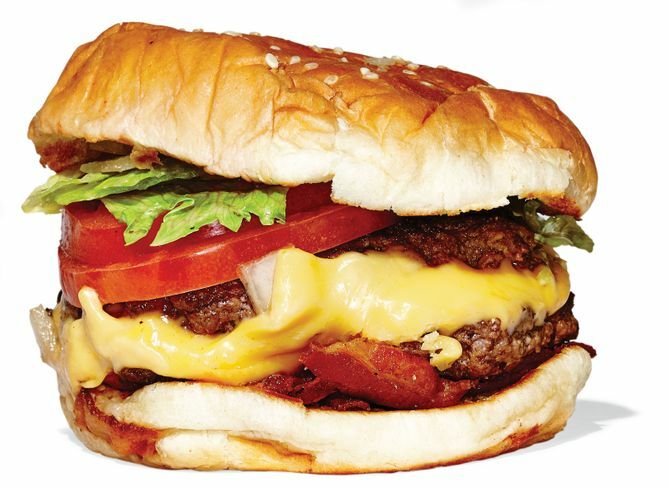 It’s the most elusive burger in town, and worth the effort it takes to get it. Classic: New York’s burger tradition traces back to bars and coffee shops like these. 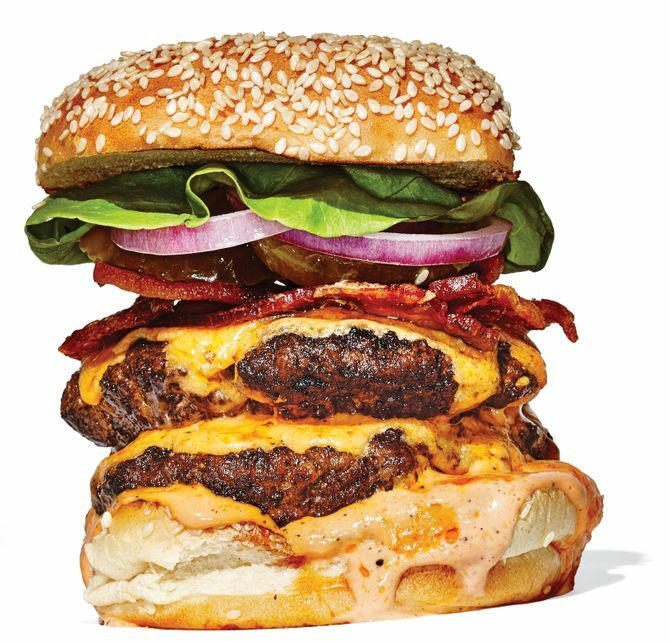 The big, floppy burgers are perfect — loose and crumbly and smashed with gusto on the griddle by a guy who’s juggling a western omelette and an order of flapjacks in between smooshes. And for contextual classic burger chomping, the hustle-bustle old-school coffee-shop atmosphere is unsurpassed. 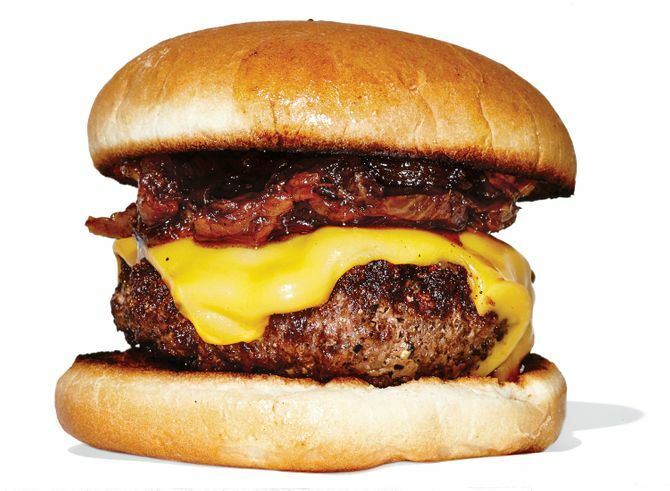 This bacon cheeseburger with decades of history has a coarse grind and a crusty sear. 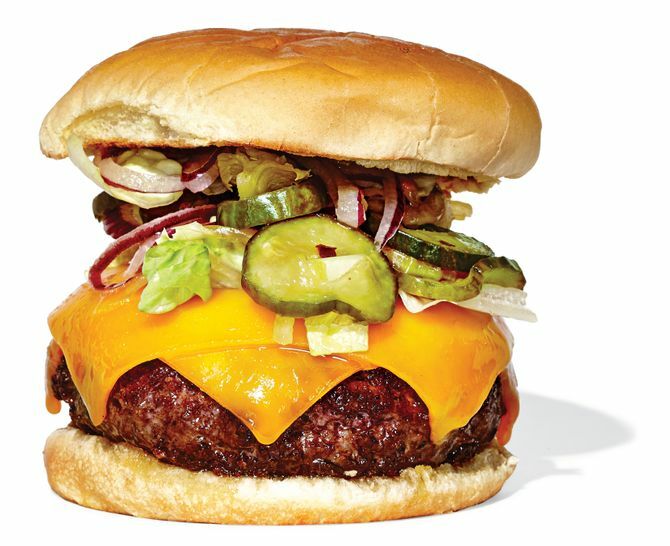 It also has the illusion of height, thanks to its jaunty perch atop a thick slice of raw onion on the plate — a trick, it’s said, to keep the bottom bun high, dry, and unsoggy. No ballyhooed “blend,” no fancy-pants bun, no name chef — just a couple of nimble grill cooks working a flattop with a grimy, weathered patina that must impart more than a little magic. The grind is loose, the shape lumpen, and the surface nicely charred. Gourmet Pub: Updates on the plainspoken, rib-sticking, hefty Irish pub burger of yore. 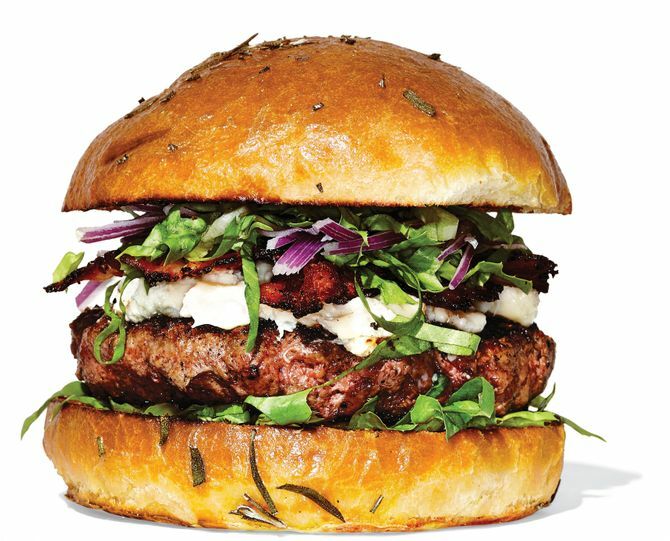 The signature five-ounce burger with roasted poblanos is terrific, but for sheer beefy excess, the half-pound pub — an ecstasy of grease and fat just barely contained by its standard-issue squishy bun — can’t be beat. Some say this dish earned the Pig its Michelin star, and on most nights there’s at least one on every table. 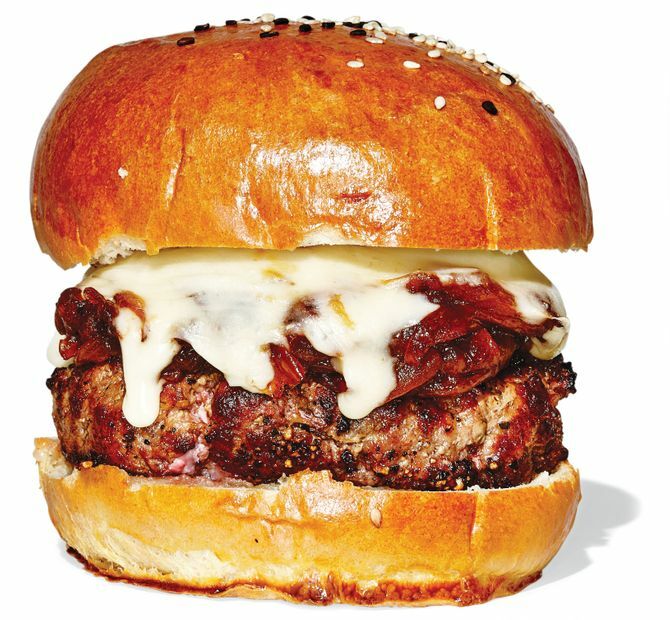 The short-rib-heavy half-pound patty stands up to its mantle of salty-creamy Roquefort, and don’t bother asking — the chef won’t hold the cheese. Big and beefy — or rather, lamby — April Bloomfield’s Spotted Pig sequel wears a veil of feta and rings of red onion, and sits in a sturdy ciabatta bun. It’s so good that those aficionados who claim a burger is not a burger unless it’s beef allow it as the exception to the rule. 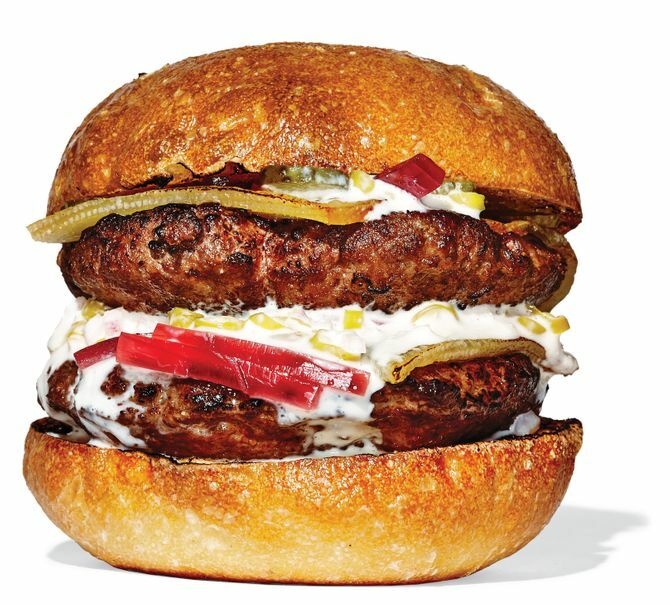 Grass-fed: The p.c. burger for ecominded eaters. 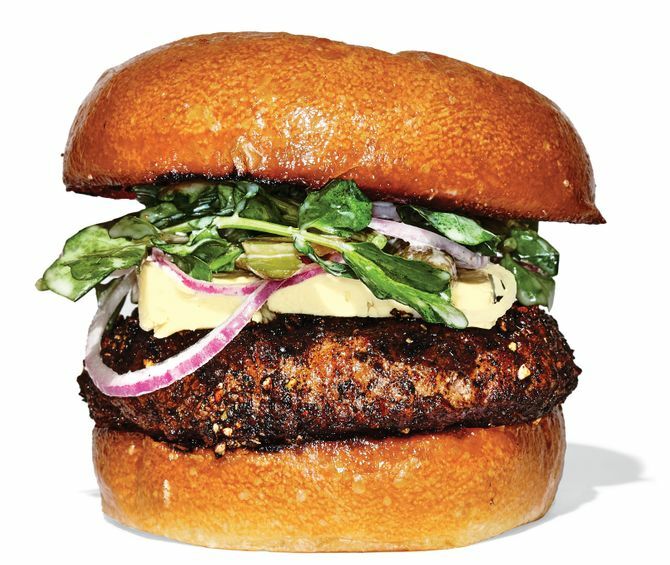 Like the owner’s Hudson Valley farm, whence comes the meat, this restaurant is Animal Welfare Approved and might possibly serve the most guilt-free burgers on the planet — even when adorned with Cheddar, bacon, jalapeño relish, and chipotle mayo. Whole animals from upstate farms like Kinderhook and Slope are broken down by an in-house butcher every week, which means chef Sean Rembold always knows exactly where his grind comes from. 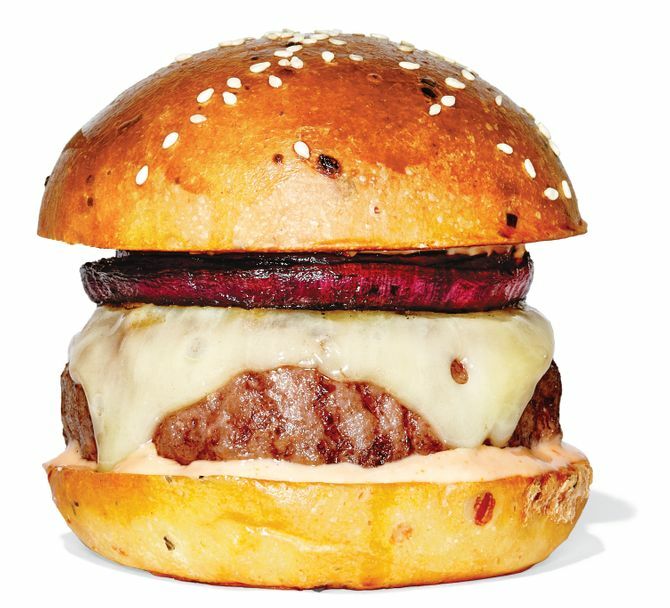 Seamus Mullen’s “butcher’s burger” hits all the obligatory locavore notes (New York State meat, house-cured bacon, house-pickled vegetables) and all the hoped-for organoleptic ones, thanks in part to some extra beef fat in the blend and on the bun. 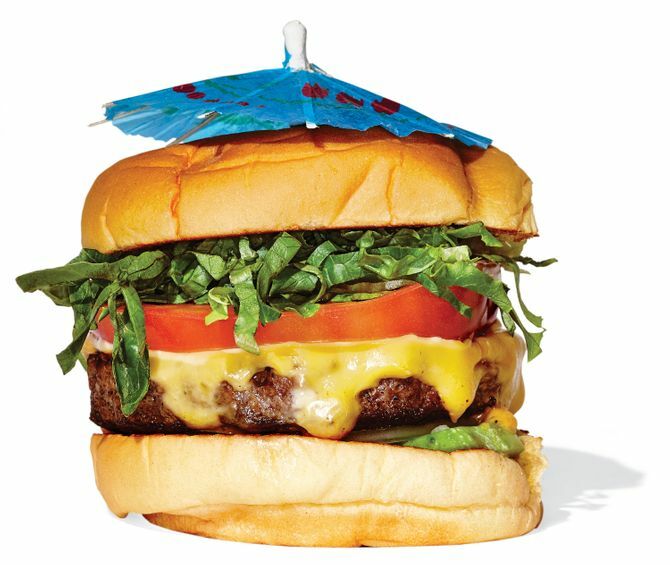 Here’s a case of good burger-making being as much about smart shopping as anything else. 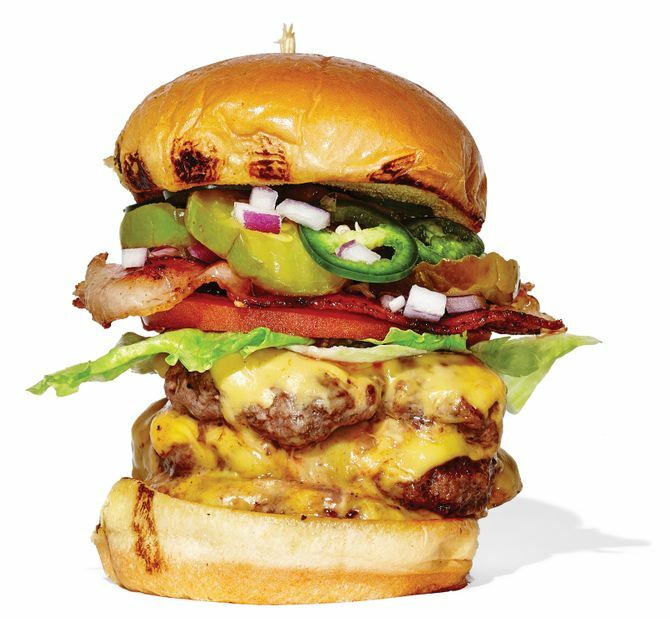 The Cheddar is Cabot, the bacon is Nueske’s, the brioche bun is housemade, and the beef comes from a family-run Missouri farm. If you want a slice of tomato, come back when they’re in season. Served as part of a $28 prix-fixe lunch or $32 prix-fixe brunch. Out-of-Towners: National chains that have improved the local landscape. Concretes? Check. Chicago dogs? Check. 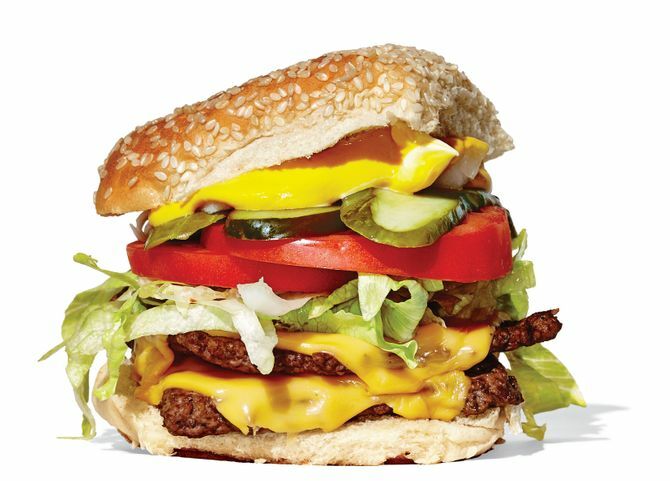 This Florida import has taken many pages out of the Shake Shake playbook, but its cheeseburger holds its own: a double by default, with good beefy flavor and a proficient melt. Named for the classic fry-cook technique whereby a ball of fresh ground beef is, literally, smashed on a butter-slicked griddle for ten seconds. The resulting texture — crisp, lacy outer sear; loose, crumbly grind — is a marvel. 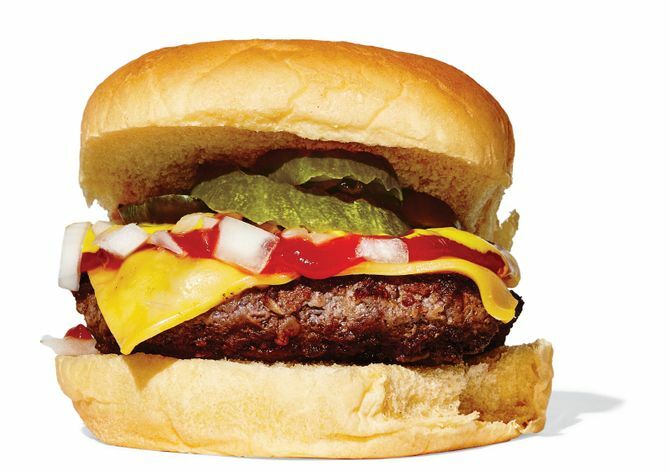 At this venerable midwestern chain and Shake Shack inspiration, the patties are pressed so flat they’re almost 2-D, yet somehow still juicy — unless you’re talking about the Signature Steakburger, a fancier blend permitted to retain its unsmashed plumpness. 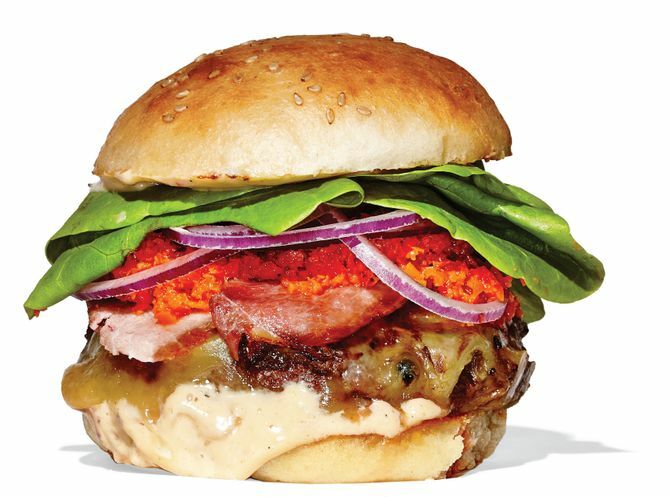 The food-lab focus on the fifth taste can seem shticky, but the proof is in the juicy, loosely packed patty, bedecked with proprietary powders, dusts, and sprays, not to mention shiitake mushrooms, roasted tomatoes, and a Parmesan crisp. 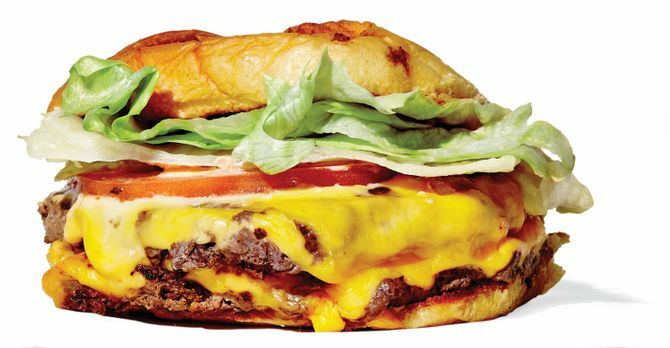 This Virginia-born franchise monster gets attention for its free peanuts and fresh-cut fries, but its greatest contribution to the better-burger category is its free-toppings customizability. 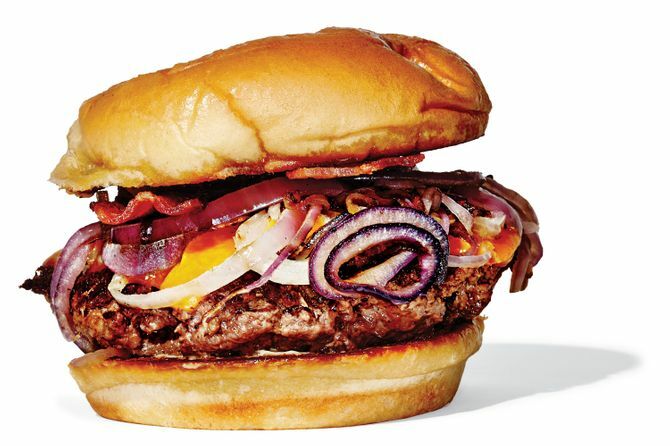 Dry-Aged: The biggest trend today: burgers that taste like full-flavored beefsteaks. The wild-card addition of beef heart makes this house-ground dry-aged blend as rich and funky as any out there, Minetta included. Plus good Cheddar, bacon-onion relish, and a brioche bun with enough squish to satisfy the Martin’s crowd. 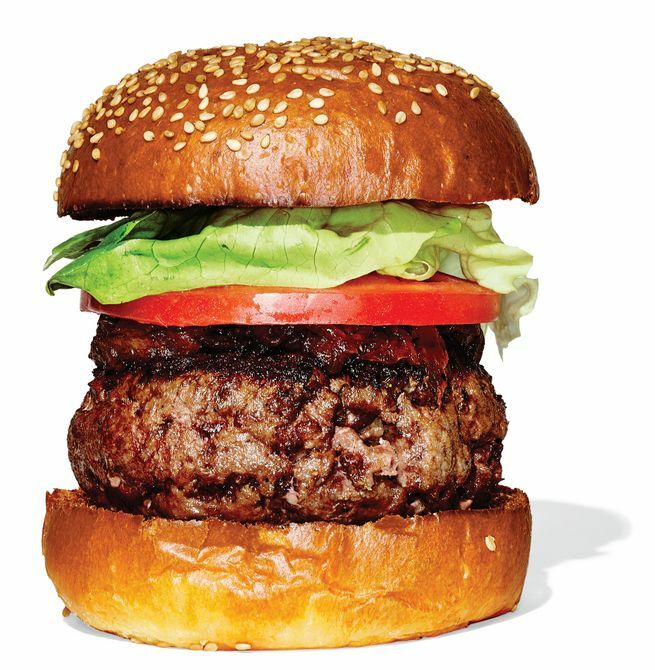 Jesse Schenker’s lunchtime burger is a beautiful thing: a thick puck of dry-aged beef, loosely packed to allow all those succulent fat molecules enough space to do their job. 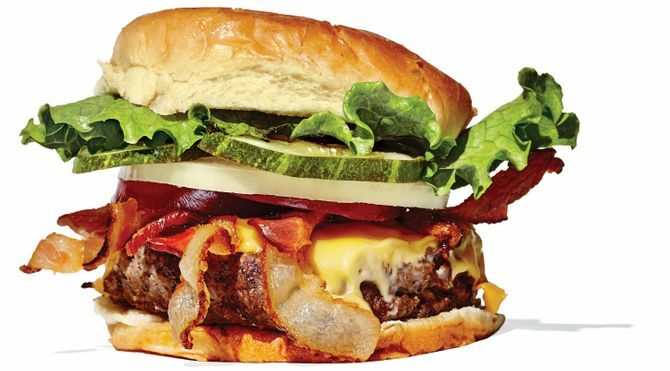 At $16, it’s one of the best dry-aged-burger bargains in town. 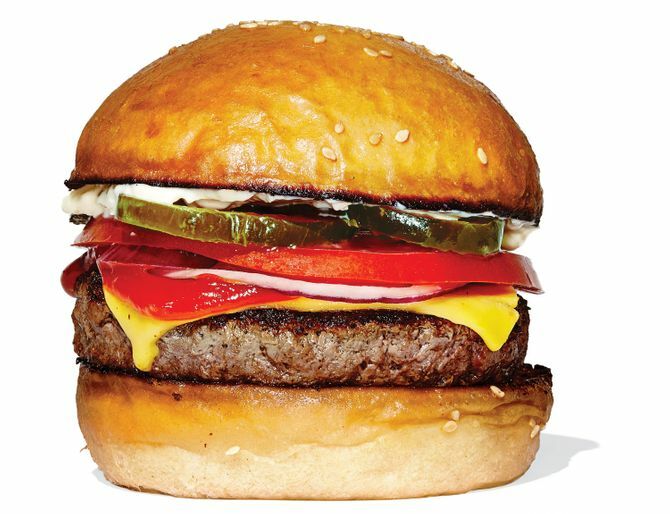 Before Minetta, New York burgers weren’t listed on menus as “dry-aged.” Now it’s commonplace. The Black Label is still remarkably rich and costs only two bucks more than the day it debuted in 2009, which is not nothing considering beef prices. Get it with cheese despite scoldy purist dictates. 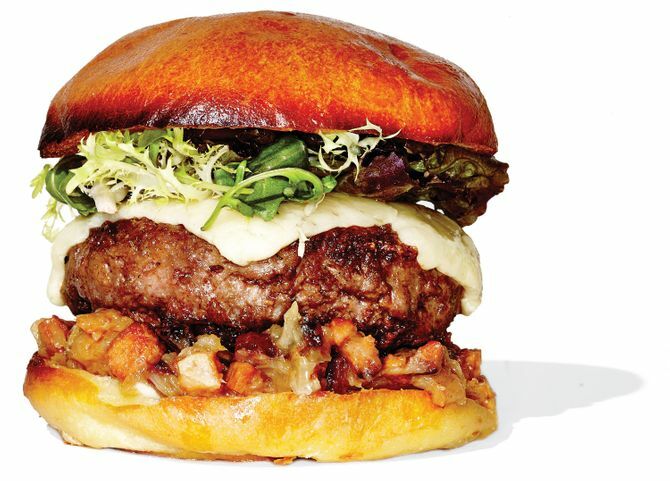 The dry-aged prime-rib patty is cut with chuck and short rib, smothered with melted Gruyère, dressed up with roasted mushrooms, and finished off with a swab of bacon marmalade — the Sriracha of the dry-aged-burger world. High-Low: The patty might be highbrow but the overall effect is unassuming and instantly familiar, like the burger-joint burgers of your youth — only better. The key is not the dry-aged beef. Nor is it the super-crunchy crust the kitchen puts on this pan-seared patty. 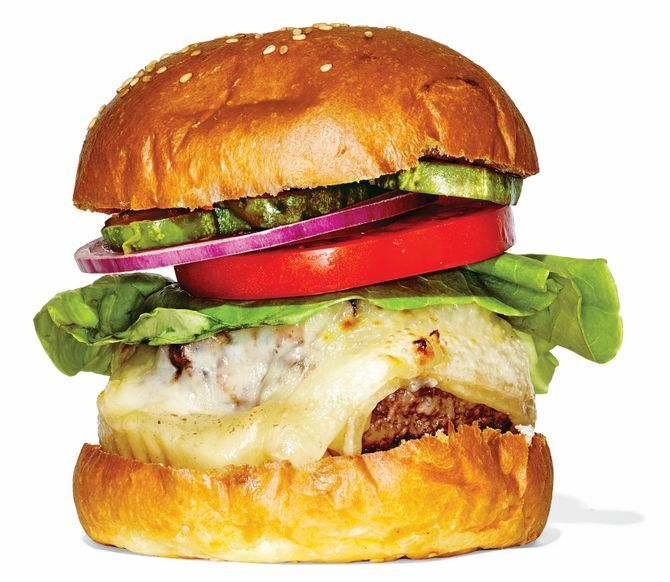 It’s chef Jeremy Spector’s much-imitated decision to treat this primo protein as a Greek-diner fry cook might, smothering it with American cheese, caramelized onions, and plopping it onto a squishy commercial bun. On paper, it sounds fancy: tomato aïoli; brioche bun; raclette cheese. 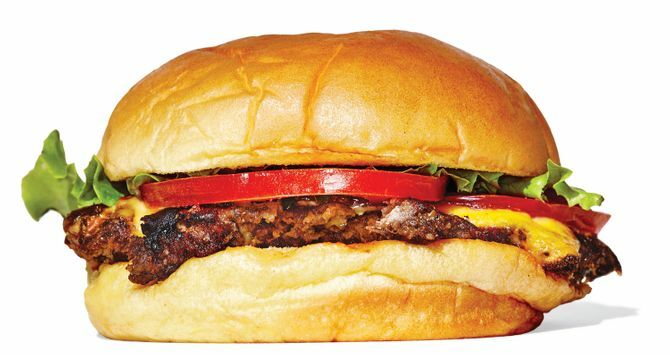 But Josh Capon’s latest is a steakhouse burger with a fast-food soul. And this might be the only 30-day dry-aged seven-ounce LaFrieda patty that gets swiped with mustard, In-N-Out-style, before it’s seared on the plancha. It may look ordinary, but, as often happens with a Wylie Dufresne production, looks are deceiving. 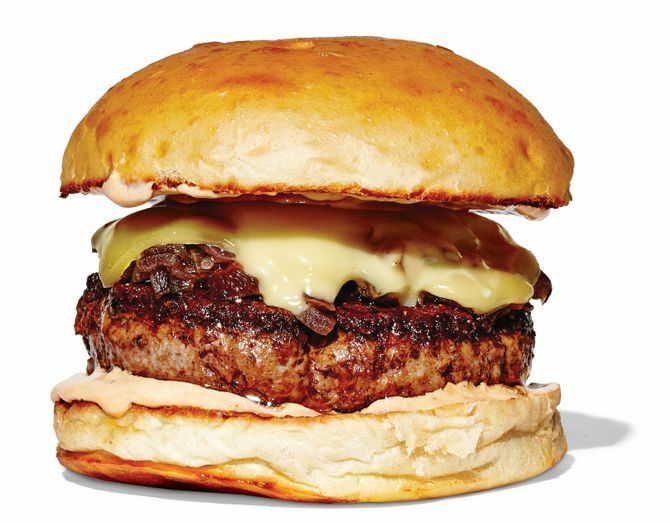 The man grinds his own beef, mixes it with shio kombu (salted kelp) to boost the umami factor, brushes his buns with dry-aged beef fat, and makes his own American-style cheese. 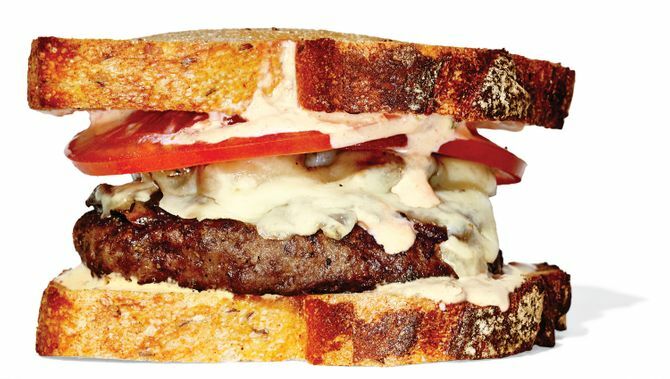 The beef they use for this patty melt goes where no patty-melt beef has gone before: into a LaFrieda meat locker, where it’s aged for 60 days. Plus great smashed potatoes on the side. Every detail is spot on and there’s terrific high-low synergy among the chef’s idiosyncratic choice of condiments (ketchup, mayo, American cheese, good-even-out-of-season tomato), housemade sesame-seed bun, and house-brined bread-and-butter pickles. Weekend brunch and lunch Fridays and Saturdays only. 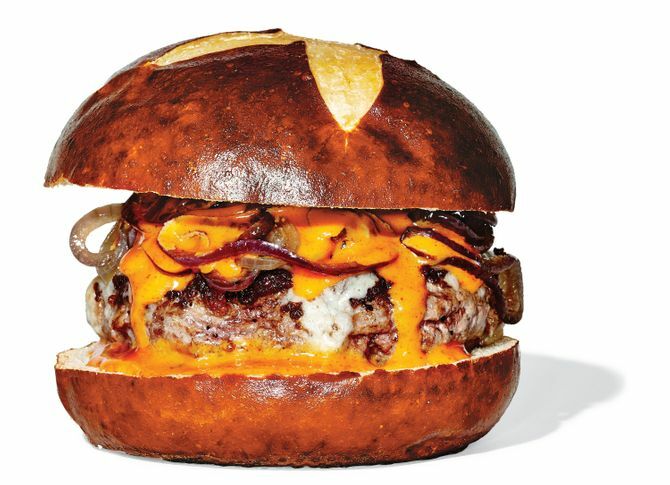 New-Wave Bar: As bar food has gotten better, so has the bar burger. 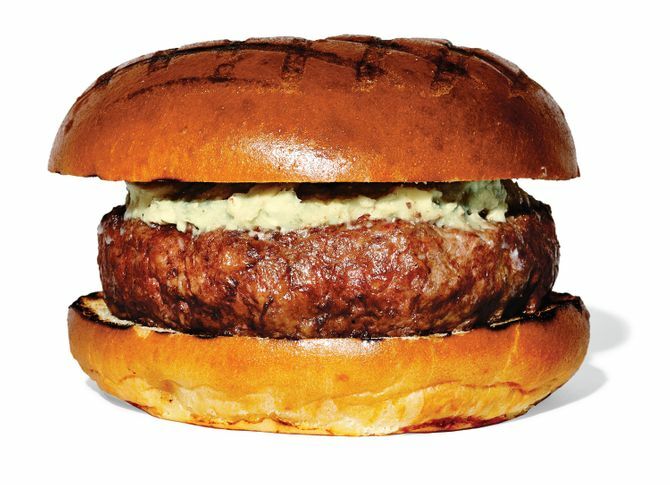 An elegant bar burger for an elegant bar: tall and imposing, but with the acquiescent bite of a fast-food burger and extra fat in the stealthy form of bone marrow and beef suet ground into the dry-aged blend. Proust had his madeleines; Dale Talde has McDonald’s cheeseburgers. This is his homage, down to the eerie precision with which he’s replicated the familiar tang of the signature condiment mix of ketchup, mustard, and chopped onion. 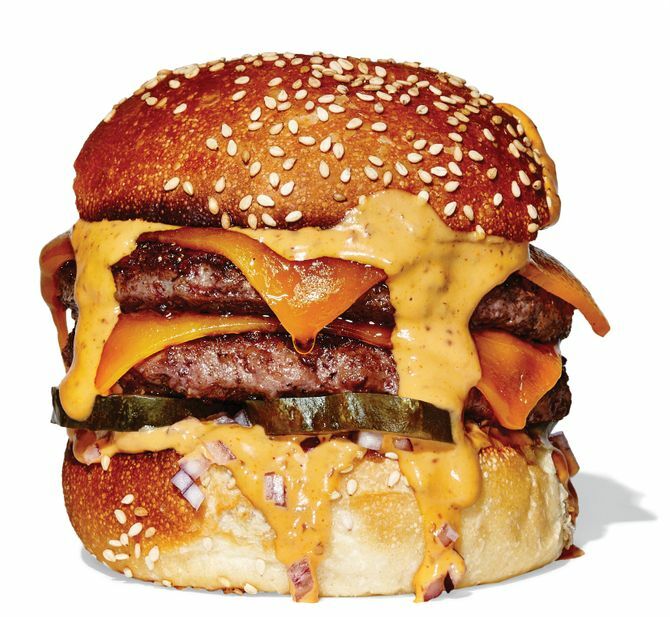 The smoked Cheddar and barbecue mayo are key, and give this mouth-waterer its distinct flavor profile. 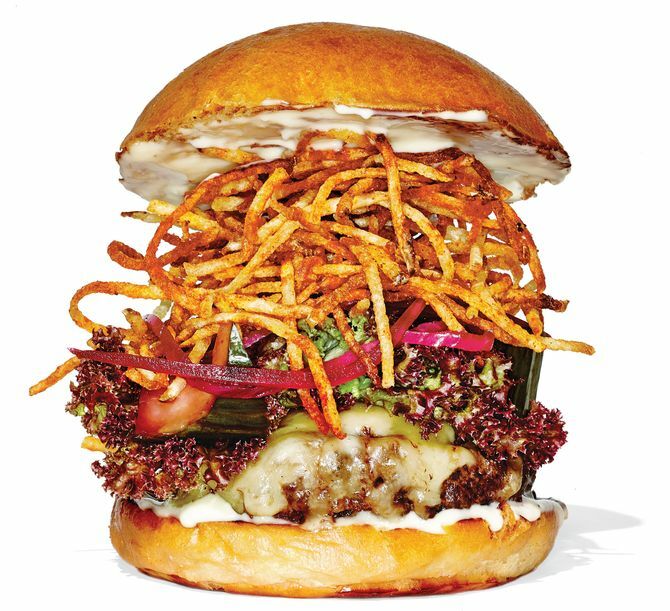 In a nod, perhaps, to the Cuban-style burger variant called the frita, a cache of extra-crispy potato sticks adds textural complexity and audible crunch. The sort of saucy, fully dressed two-hander that expresses a commitment to condiments and a reliance on napkins. 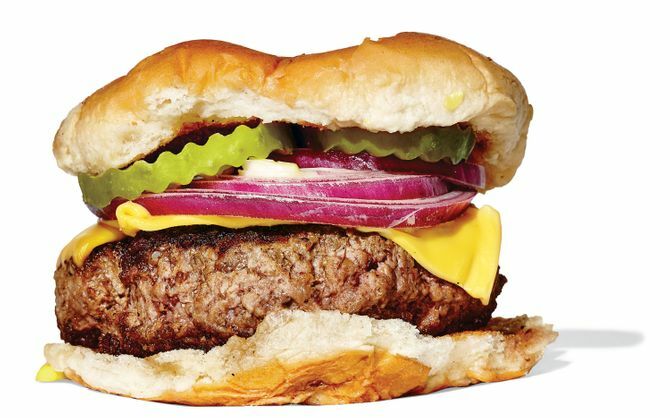 Chef Stephen Tanner has many deeply-held burger beliefs; minimalism doesn’t appear to be one of them. 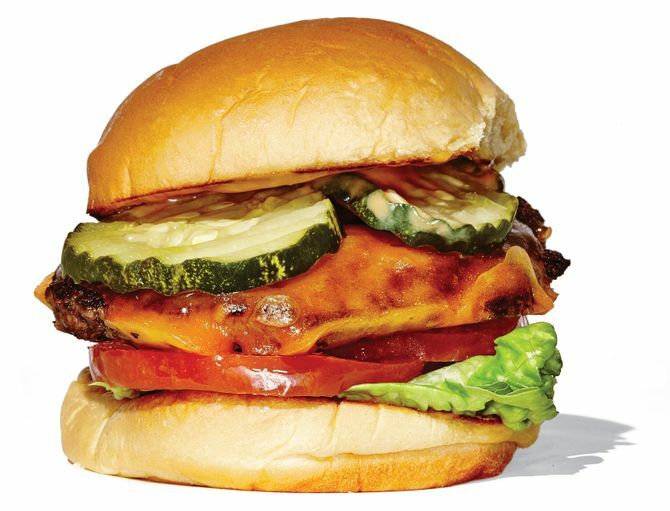 Stacked: The double, a West Coast fast-food style, is challenging the single-patty hegemony. Andrew Carmellini recently retired his seven-ounce single LaFrieda patty in favor of two four-ouncers, and the results couldn’t be better. The special sauce is rich and tangy. The two slices of cheese are well melted. The sesame-seed bun from Orwasher’s is spot-on. 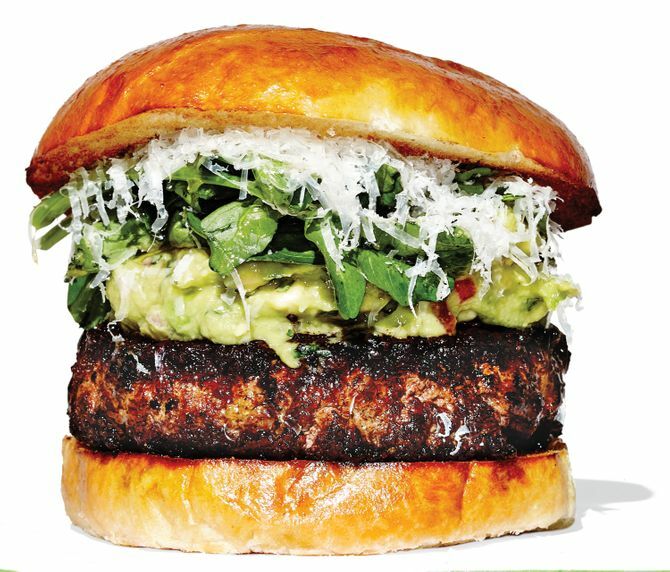 What’s most exciting about this burger, though, is that it’s a dry-aged double — a unicorn of the stacked-burger world. Three smashed patties, a molten seal of American cheese, a butter-basted Martin’s potato roll. The secret ingredient? The cumulative flavor of a well-seasoned (i.e., never cleaned) flattop griddle. 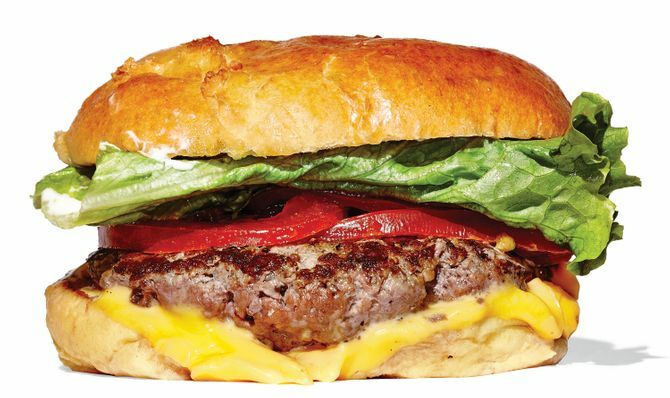 At first, Arkansas native Rob Newton’s brawny southern-style double burger seems like too much. It’s not. The boutique bacon adds oomph without stealing the show. The Mississippi comeback sauce makes other special sauces seem less so. The tangy housemade pimento cheese keeps it all together. 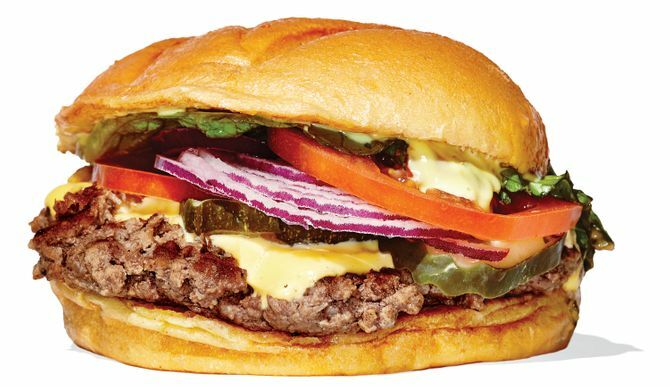 The house style is a relentlessly drippy double fashioned from two well-browned three-ounce patties fully accessorized with lettuce, tomato, American cheese, pickle, onion, mustard, and mayo on a sesame-seed bun. No Heinz, though — the owner’s from Texas, where asking for ketchup on a burger is like instructing a Katz’s deli man to put some mayo on your pastrami sandwich. 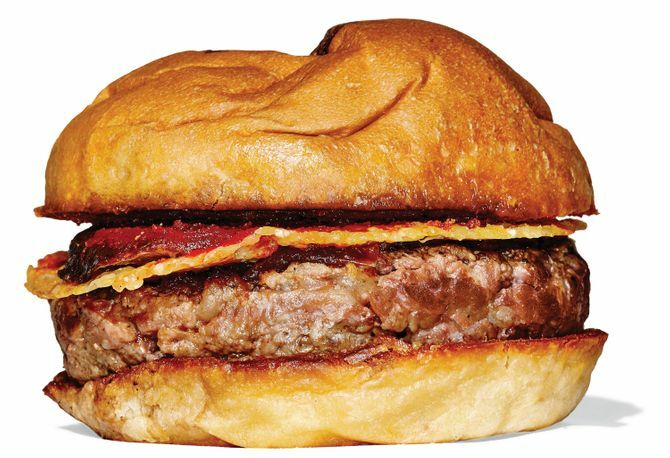 Oddball Genius: Not every burger conforms to convention. 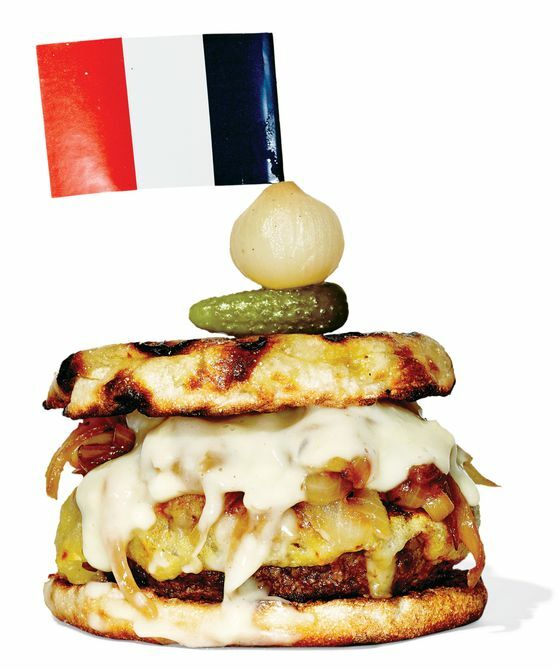 A canny impersonation of the bistro warhorse in hamburger form, with béchamel, stock-braised onions, and Emmenthaler on a Thomas’s English muffin. It’s only available as part of a prix-fixe menu; $25 lunch, $29 dinner, and $39 pre-theater. 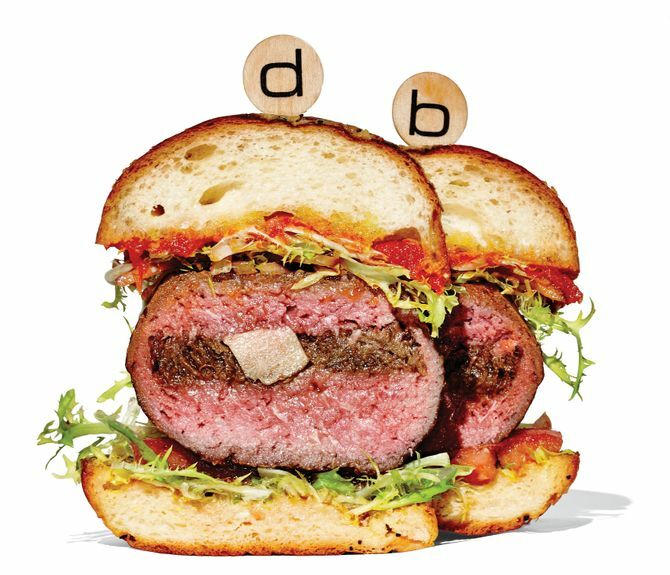 When Daniel Boulud stuffed braised short ribs, foie gras, and preserved black truffles into a ground sirloin shell, he forever changed the face of upscale burgerdom. It might not be a weekly habit, but it’s definitely a bucket-list burger. 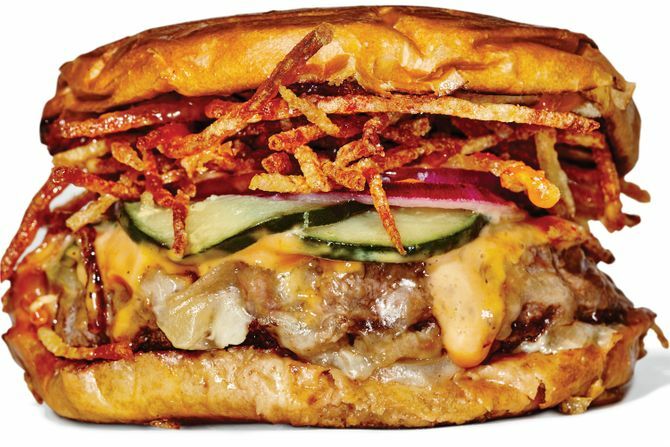 American beef burger meets crisp-chewy grilled-ramen “bun.” Worldwide hysteria ensues. The most perplexing thing about this mash-up of two of the most fetishized foods of recent history: What took so long? 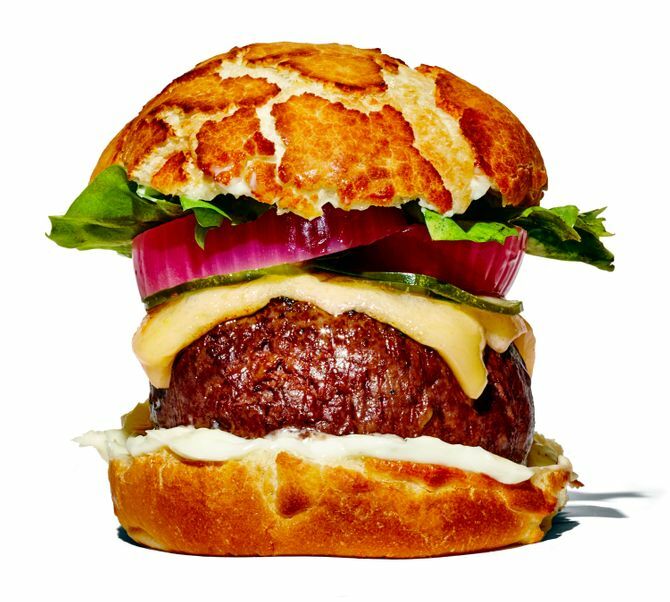 Once you wrap a grilled burger in flaky dough as if it were an empanada and toss it in the deep fryer, does it really matter if the beef is grass-fed? Also sealed within: bacon and Emmenthaler cheese. 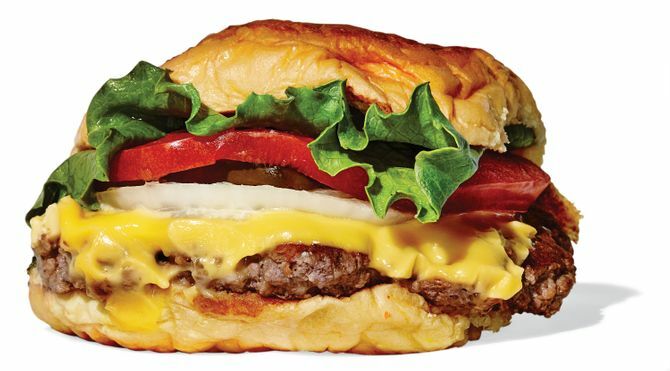 Shake Shack–Style: Danny Meyer sparked a small-pattied, squishy-bunned, American-cheesed, special-sauced movement. What began as pop-up hot dog cart has evolved into a fast-casual juggernaut. You already know its proportions are perfect, its construction solid. What’s remarkable is how consistent it is no matter where you find it--from Citi Field to the MGM hotel in Vegas. From the brothers who brought you Hale & Hearty soups comes this convincingly greasy contender, unabashedly Shackian in construction and proportion. The patty might be a little too densely packed, but otherwise, it hits the spot. 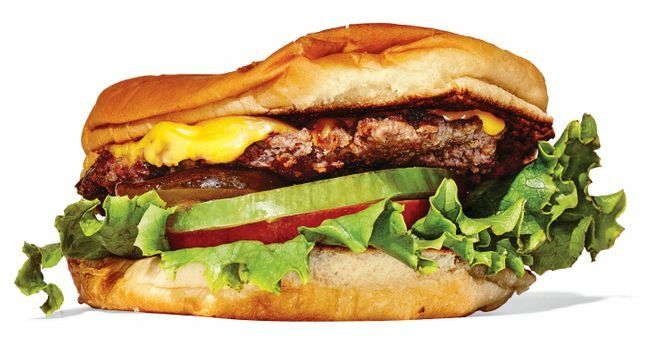 It might seem a little smaller than Shake Shack’s, but what this unassuming burger lacks in size it makes up for in good, fresh, beefy flavor. Plus no lines and no greasy vibrating patron pagers. As evocative of California as Meyer lemons and fish tacos, this Gotham West beaut is loose and juicy and well seasoned, not to mention properly dressed (that means lettuce, tomato, pickles, and sauce). 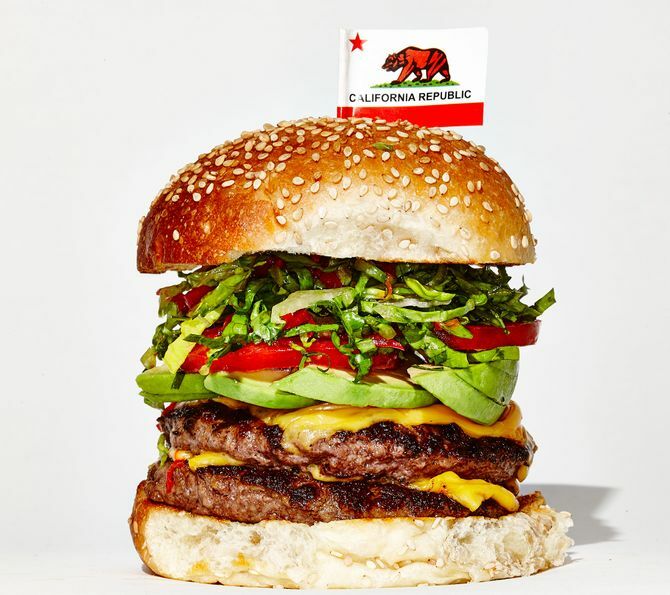 New California: Made by California chefs or with a West Coast sensibility (or both). 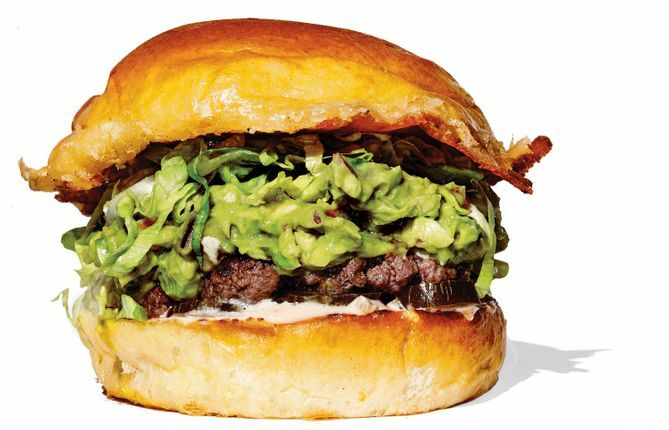 The slightly sweet, raised-pattern Dutch crunch roll (a Bay Area specialty) makes this a Cali-style burger; gourmet touches like housemade pickles and sturdy leaves of escarole don’t hurt. Danny Bowien’s lavish new double (with lettuce, jack cheese, guac, pickled jalapeno, salsa especiale, and hot sauce on the side) combines the produce-forward appeal of a West Coast burger and the too-much-is-never-enough spirit of a Mexican torta. The beef, though, is one hundred percent La Frieda, ground fresh daily in Jersey. Odd that you can find one of the city’s best burgers in a restaurant known for its rotisserie beets and carrots Wellington and also run by a quasi-vegetarian chef. 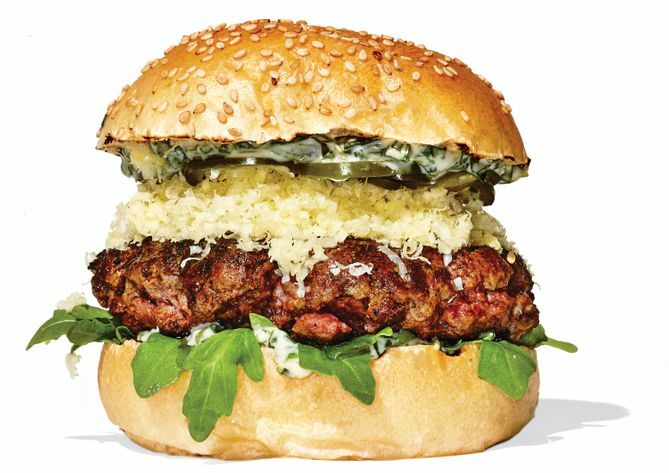 But there it is all tender and succulent and dressed in the signature New Cali style with jalapenos and guacamole, plus watercress and a flurry of Microplaned Manchego. Lunch and brunch only. 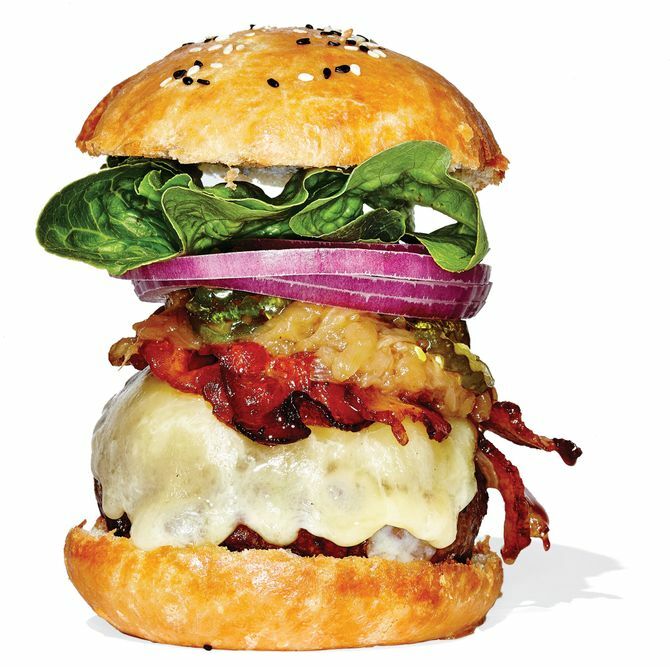 In deference to his home state, Justin Smillie’s grass-fed double cheeseburger comes fully loaded: lettuce, tomato, scallions, avocado, peppadew peppers, and gobs of a creamy Green-goddess-like dressing. He even plants a tiny Republic of California grizzly bear toothpick flag in the middle of the thing to drive home the point.